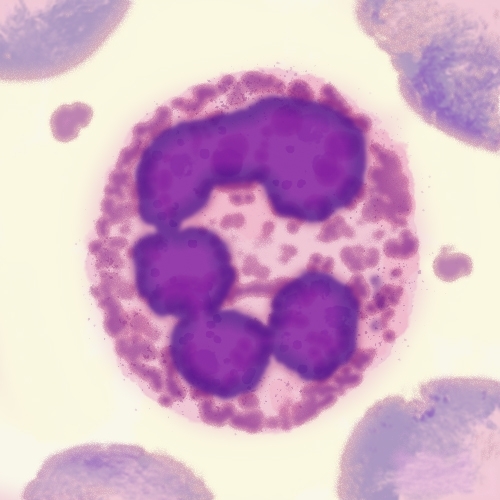 Neutrophil, a class of leukocytes, with segmented nucleus and intracellular granules; 2D rendering. Activation of cytokine tumor necrosis factor (TNF)-mediated molecular pathways induces changes in the morphology, motility, and adhesion of neutrophils, a class of leukocytes, early in vascular inflammation and in related diseases, including atherosclerosis, sickle cell anemia, stroke, and sepsis. Neutrophils migrate to sites of inflammation where they adhere to the vascular endothelium. Alterations in a cell’s shape, motile behavior, and/or adhesiveness, require dynamic re-organization of the actin cytoskeleton. Here, Silveira et al. report that actin polymerization was necessary for TNF’s effects, which in turn, focused attention on GTPases such as RhoA, a well-known regulator of actin cytoskeletal dynamics and F-actin re-modeling. As might be expected, TNF increased RhoA activity in neutrophils, but through RhoA-mediated pathways independent of the downstream effector protein Rho kinase. Instead, mDia, a regulator of actin nucleation and member of the formin family of Rho effector proteins, was implicated. SMIFH2, a formin inhibitor, eliminated TNF-mediated increases in neutrophil morphological changes and adhesion. Cytoskeleton’s RhoA G-LISA activation assay kit (Cat. # BK124) was essential in quantifying RhoA activity in a sensitive and reliable manner. Deciphering the molecular pathways responsible for TNF-stimulated changes in neutrophil morphology, motility, and adhesion offers a therapeutic target for reducing leukocyte-regulated inflammatory responses. Silveira A.A.A. et al. 2018. TNF induces neutrophil adhesion via formin-dependent cytoskeletal reorganization and activation of beta-integrin function. J. Leukoc. Biol. 103, 87-98.